Do I need another portable gaming device weighing down my backpack every time I leave the house? My spine says no, but the retro gamer in me loves the idea of taking an NES with me wherever I roam. As handheld consoles go, My Arcade’s RetroChamp, announced at CES this year, pushes the boundaries of portable gaming. But for $80 (around £62, UK pricing TBC), its versatility makes it worth a spot in your throwback console collection. 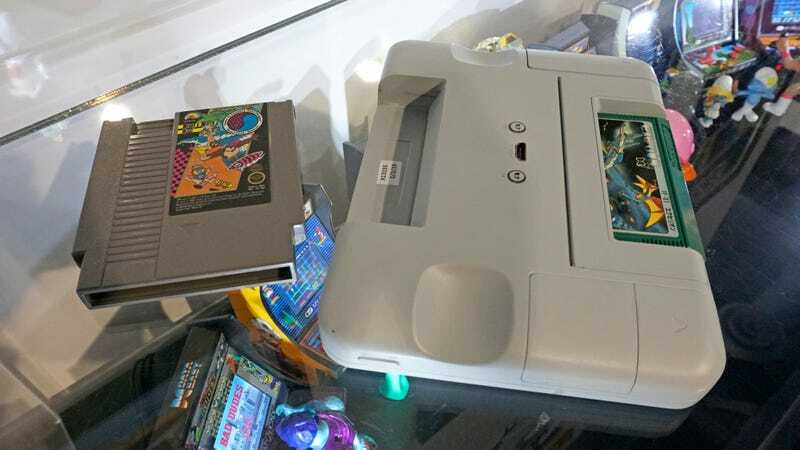 MyArcade made a few trade-offs to keep the RetroChamp priced well under $100, including limiting it to only playing games using original NES or Famicom cartridges; there’s no built-in storage or memory card slots for loading your own ROMs. The dual cartridge slots also contribute to the RetroChamp’s monstrous form factor. It’s easily the largest portable gaming device I’ve ever held, but at the same time, I was pleasantly surprised at how light and comfortable it is to actually hold. 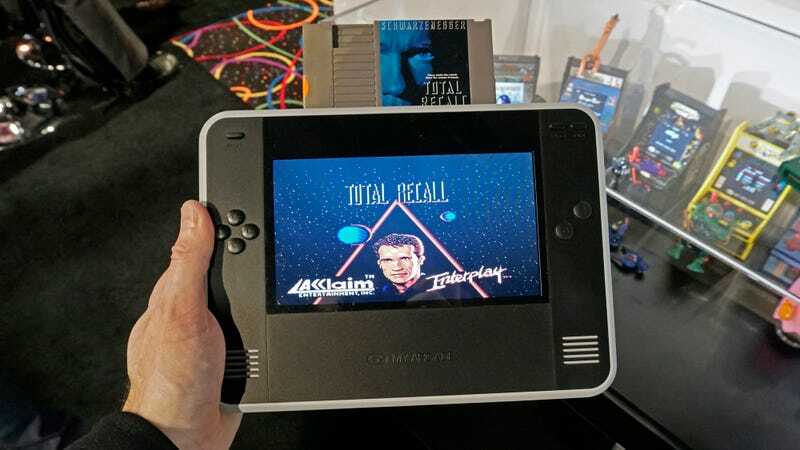 To make good use of its size, the RetroChamp features a seven-inch LCD display which is actually larger than the one included on the Nintendo Switch. It doesn’t have any touch functionality, and it’s not going to win any ‘Best of CES’ awards for resolution, viewing angle, or colour reproduction, but it was totally adequate for playing old 8-bit games, which, let’s be honest, never looked that amazing to begin with. One curious design decision on the RetroChamp is the use of four separate buttons instead of a rocking directional-pad. It didn’t take away from the gameplay at all, and My Arcade says the RetroChamp’s design is far from finalised. 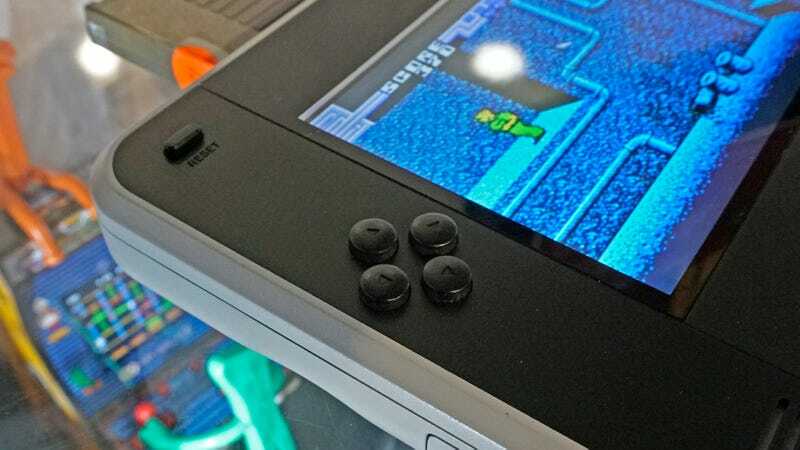 Many elements will change by the time it goes into production, and that could include swapping these buttons for a classic D-pad like the NES’ original controllers used. My Arcade originally claimed the RetroChamp had a rechargeable battery that was good for 35 hours of gameplay. That was an impressive claim, and, as it turns out, not an accurate one. On a full charge, the RetroChamp will actually run for around three to five hours, which is enough time to get tired of playing NES games on a long flight. You won’t find a giant, heavy battery inside the RetroChamp’s housing, but there is a unique accessory you won’t find on any other portable gaming system. 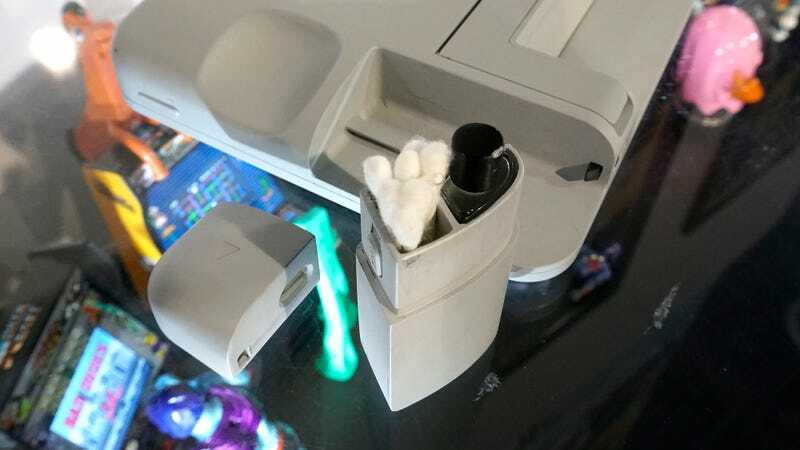 A removable compartment on the back houses a small cleaning kit – including cotton swabs and a cleaning solution – so that you can ensure that the metal contacts on your 30-year-old NES carts aren’t dirty or corroded, preventing them from working in the system. In other words, you’ll never have to blow on your old carts to make them work. The RetroChamp includes a folding kickstand like the Nintendo Switch, but this one actually works. The handheld can also be connected to a TV through HDMI, and works with My Arcade’s wireless controllers so you can turn it into a true console.